Rep. Joe Barton (R-Texas) suggests shutting down services that ISIS uses to communicate. A Congressman Wants to Censor the Internet to Thwart ISIS’ Digital Strategy. Horrible Plan. 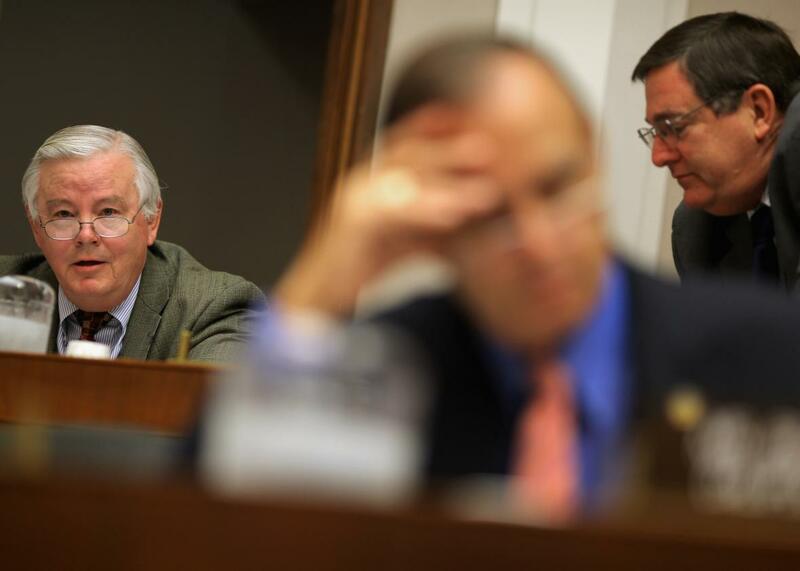 Joe Barton (left) at a House Energy and Commerce Committee meeting in 2011. Everyone is concerned about how the Islamic State communicates, both in general and to orchestrate violent acts. The attacks in Paris have motivated fresh debates weighing the privacy and safety implications of digital services that encrypt communications but do not provide backdoors for law enforcement. But there is a far less complicated way to deal with both digital propoganda and clandestine communication channels: Shut them down! The approach seemed to appeal to Rep. Joe Barton, Republican of Texas, on Tuesday during a House Energy and Commerce committee hearing. The Hill reports that Barton asked the Federal Communications Commission, “Isn’t there something we can do under existing law to shut those Internet sites down?” He realized that there might be practical challenges to this plan, saying, “I know they pop up like weeds,” but the potential First Amendment issues didn’t seem to weigh on him until later. In a statement Tuesday afternoon, the Washington Post reports, Barton explained that he was “in no way suggesting we shut down the Internet.” And added, “I am very mindful of privacy and First Amendment issues on the Internet.” FCC chairman Tom Wheeler also clarified that the agency doesn’t have the authority to shut websites down. Cutting ISIS off from digital connectivity seems to appeal to some Twitter users, though. @JohnKerry Mr secretary is it possible to cut off internet from the region of Isis so they can't communicate,at least not through internet? Why can't we cut off Internet in areas where Isis are making these threatening videos? Give them no phone or Internet- do they pay bills? But as commenters in a Hacker News forum point out, “ISIS uses the same infrastructure that innocent people use across multiple countries … They are not isolated in caves using their own infrastructure.” And more generally you can see how it wouldn’t be ideologically sound to censor a group that is widely condemned for … human rights violations like censorship. Quick fixes are alluring, but usually aren’t as simple as they seem.